Winter is Coming… and so are the Free Spins! Are you looking for free spins? How’s about some top rewards to celebrate the final season of Game of Thrones releasing this month In different parts of the world, either autumn or spring has begun. If you are a Game of Thrones lover, no matter where you are, Winter is Here! Game of Thrones fans get ready to watch the final season of the popular TV series. The final season starts this month, making it the perfect time to bring winter’s chill to King Billy Casino! There are three special bonus offers, each named after well-known Game of Thrones characters. Choose the bonus that fits your personality or simply play them all. Targaryen Bonus: Are you good to your own people, but somewhat ruthless when it comes to your enemies? If so, you belong in House Targaryen. The Targaryen Bonus offer is a 50% match deposit bonus up to a total of AU$100. Redeem this offer with the coupon code TARGARYEN. Stark Bonus: Do you fight for your land? Do you take pride in the battle to protect your land? If you answer yes to this question, you belong in House Stark. The Stark Bonus gives you a large number of free spins. Redeem 83 free spins with the STARK coupon code. Lannister Bonus: Do you replay your debts? Do you get revenge on those who wronged you? 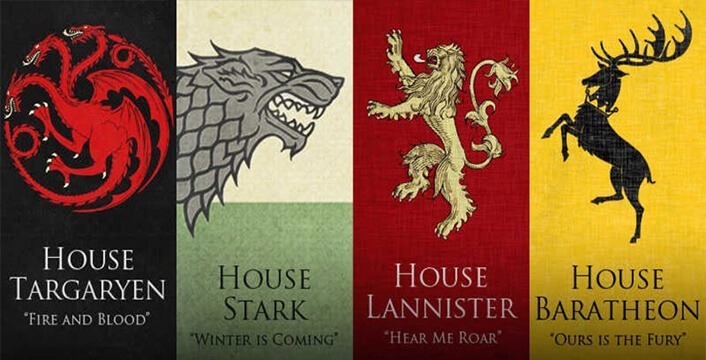 Answer yes to these two questions, and you clearly belong in House Lannister. The Lannister Bonus brings with it both a match deposit offer and free spins. Pick this house, and get a 30% match deposit bonus up to a total of AU$100, and 30 free spins. Redeem the bonuses and free spins with the LANNISTER coupon code. Note the following important points before claiming the above bonus and free spins offers. Once you understand the terms and conditions, get playing now because… Winter is Coming! The free spins offers are the 83 free spins for House Stark, and 30 free spins for House Lannister. Play the free games on Betsoft Gaming’s Fire & Steel slot game. Each of these bonuses is available once each week in April 2019. The minimum deposit for the Targaryen Bonus is AU$20. 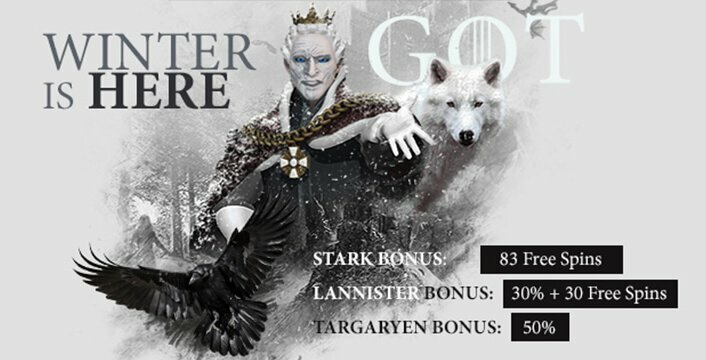 Deposit at least AU$50 for House Stark’s free spins offer. Make a deposit of at least AU$50 for the Lannister Bonus and free spins offer. There is a 35x wagering requirement on the above special offers. After fulfilling the play through requirements, the maximum win possible is AU$200. Cryptocurrency users cannot take part in the Game of Thrones – Winter is Here promotion. Make four successful real money deposits at King Billy Casino before using the Game of Thrones bonuses and free spins. In addition to the above bonuses and free spins, the King’s Daily Tournament awards 335 free spins every day. Compete with the other Citizens, and climb your way to become the King’s Champion. Enter this promotion automatically by playing participating slot games each day of the tournament. Gather points each time you wager and play on the participating slots. The more you bet and play, the more points you earn. The more points you earn, the more quickly you climb the tournament’s leaderboard. Participate in the leaderboard race anew each day. The King’s Game of Thrones Tournament starts at 12:00 UTC, and ends at 11:59 UTC the next day. This means you play from midday to midday for a single tournament day. The more you play, the better your chance of climbing to the top and winning one of the seven prizes. Note: Make sure your personal information is up to date in your casino account info before participating in the tournament. This is especially important should you climb to the winning leaderboard positions. The top seven leaderboard winners each receive free spins on Betsoft Gaming’s Fire & Steel slot game. King Billy Casino awards the free spins winnings after the tournament ends each day. If you’re a winner, expect to find the Fire & Steel free spins in your casino account the next day. There is a 10x wagering requirement on free spins wins. Enjoy the chill of the chase in the Winter is Here Game of Thrones tournament today!